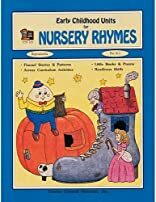 Early Childhood Units for Nursery Rhymes provides cross-curricular activities and a multitude of Learning Center ideas. Reproducible little books for emergent readers provide a connection between school and home, promoting family literacy. About SANDRA MERRICK (Author) : SANDRA MERRICK is a published author. A published credit of SANDRA MERRICK is Early Childhood Units for Nursery Rhymes.